As it is low power, range is 10m (33 feet) most of the time. For audio, Bluetooth can be used to connect a media player and a headset wireless. Mobile phones and Bluetooth headphones are a well know example. Analog gear can be made wireless by adding a Bluetooth sender to the analog out and/or a Bluetooth receiver to the analog in. You can turn any wired headphone into a wireless one using a portable receiver. High quality stereo audio is obtained using the A2DP ( Advanced Audio Distribution Profile) protocol. 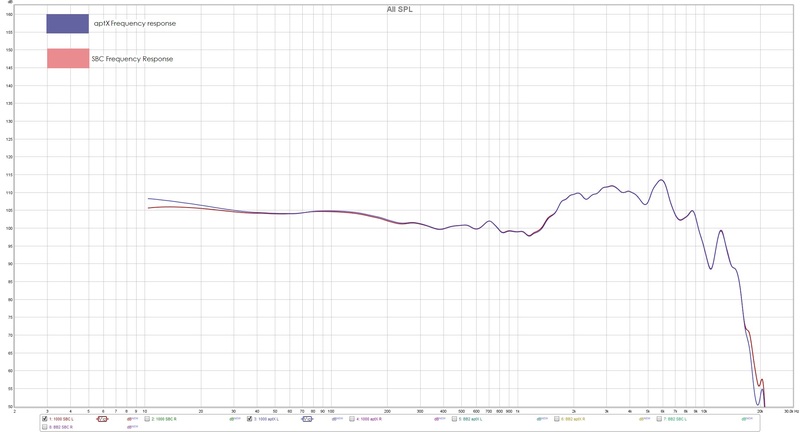 High quality means “high” relative to the Headset Profile with its 64 kbps mono stream. The SBC (sub-band codec) is the mandatory audio codec. This profile limits the available maximum bit rate to 320kb/s. Codecs listed as optional are: MPEG 1 & 2 Audio , MPEG 3 & 4, AAC, and ATRAC(Sony). Vendors can also implement their own protocols. As it is not a mandatory part of the standard you need both a sender and a receiver (SouRCe and SiNK in Bluetooth lingo) supporting this protocol. Although many think so, aptX is not lossless. It is an alternative for the standard SBC codec. In January 2016 Qualcomm announced aptX HD, it support 24 bits / 48 kHz LPCM audio over Bluetooth. Compression remains at a ratio of 4:1, with a bit rate of 576kbps. Although the data rate is substantially higher compared with aptX, it is and remain a lossy codec. LDAC is Sony’s proprietary protocol. It can transmit up to 990kbps over Bluetooth. Android 8 supports both aptX and LDAC. Only available on Huawei smartphones. It claims a 900 kbps throughput. FLAC is roughly half of it. There are lossless protocols like Kleernet and SKAA. They support lossless audio but products supporting these protocols are a bit rare. SBC or aptX work like all codecs. The audio is compressed (encoded) by the Bluetooth sender, send to the receiver and decompressed (decoded) there. Regardless of the audio format there will always be this lossy conversion. What if both also supports a codec like AAC. Will the ACC file send directly to the receiver without this conversion? Technically this might be possible but I don’t think it works that way. Select a AAC file in a media player. The media player invokes a codec (AAC of course) and expand the audio to raw PCM. If we want to use any kind of DSP e.g. volume control, it has too. If we use a mixer like DS in Win or Core Audio in OSX, it must be raw PCM. As far as I know, it is pretty difficult if not impossible to do any kind of DSP on compressed formats unless one expands them to PCM. Hence I expect a media player to decode any format to PCM and send this to the audio device including our Bluetooth radio regardless of the codec used by this device. This makes the scenario of sending any compressed file e.g. AAC straight to a Bluetooth sender a bit unlikely. However, this is written with a PC in mind. Bluetooth headphones have their own control like volume, next track, etc. In this case it is possible that e.g. a AAC file is send unaltered to the headphone and all processing is handled there. On Android 8 it is possibe to control the Bluetooth settings. Rtings measured both frequency response and total harmonic distortion. The differences between aptX and SBC are very small. There is a small difference in latency between SBC and aptX. In both cases still a bit too high for watching video (lip sync). If you are in need for low latency, aptX LL is the best codec.